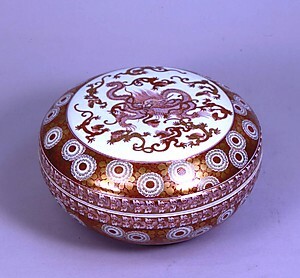 The period from the Meiji era to the early Showa era saw the rise of Kutani potters as independent artist and the industrial promotion by the new Meiji government after the collapse of the Edo shogunate, saw the Kutani porcelains export industry prosper as a result. Because of the administration transfer from the Edo shogunate to the Meiji government at the time of the Meiji Restoration, the potteries could no longer receive the support from the feudal load and were forced to be self-sustained in the operation. The potters of the old Daishoji clan made efforts to pursue reputation by further improving the quality of works as an individual artist of arts and crafts rather than as one of many craftsmen based at the same kiln. 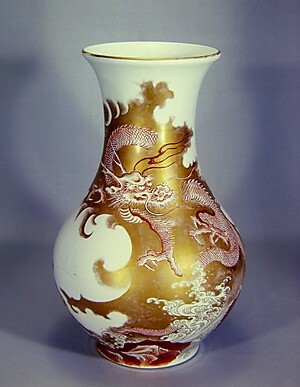 Among the many master craftsmen, there emerged outstanding artists such as TAKEUCHI Ginshu and his brother ASAI Ichimo, leaders for the next generation artists in over-glaze enamel techniques. Also SUDA Seika 1st, who taught ceramics to KITAOJI Rosanjin having already played a major role in writing and food. On the other hand, potters who had worked for the Old Kaga clan found a new opportunity in the export industry for Europe and American markets and produced a large number of Kutani ware; mainly “Akae” porcelains with a lot of gold ornaments applied on as flagship. KUTANI Shoza was well known for red detailed drawings and gold ornaments, and therefore was a pivotal figure of the movement.